North Jakarta Mayor, Husein Murad together with North Jakarta City Leaders Forum (Muspiko) monitors food prices in Sunter Podomoro Market, Sunter Agung Urban Village, Tanjung Priok and Inpres Market, Kelapa Gading Timur Urban Village, Kelapa Gading.
" There is no problem. Food supply and price are still stable and controlled"
According to him, this activity is done to anticipate food prices from rising and monitor staple commodities supply ahead of Eid Al-Fitr 1439 Hijri. Based on this monitoring, his side didn't find any significant price increases and food commodity supply is relatively safe. "There is no problem. Food supply and price are still stable and controlled," he stated. He explained, increased price on market is still relatively reasonable according to fluctuations. Based on his monitoring, onion price rises around Rp 10 thousand and it is the highest increase above red cayenne and and green cayenne peppers. His side ensures to maintain sufficient food stock in market by coordination with related institutions to maintain food supplies. Food price monitoring will be conducted intensively thus merchant will not determine price too high. He added, all this time Jakarta Government holds market operations in almost all markets to maintain price stability. Besides bazaar which is held up to RW level is also helped residents to get commodities in affordable price. 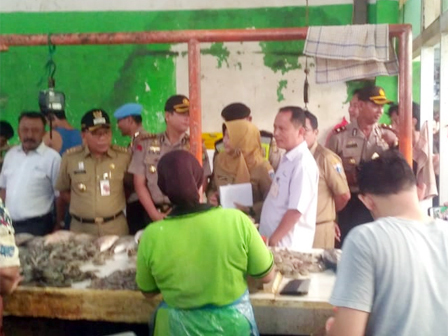 North Jakarta Metro Polres Head, Kombes Pol Reza Arief Dewanto said, his side did not see any indication of cheat merchant who aims to raise the prices in this monitoring. "We have not seen any deviations that cause price to rise. Mostly it is still in normal mechanism," he stated.